The concept of outdoor cinema is not encountered in many places of the world. Summer cinemas are actually a unique characteristic of Athens. Athens open air cinemas offer a true cultural experience. Spectators get to relive all-time classics, watch new blockbuster releases and enjoy European independent productions, all in a friendly and warm atmosphere, combined with amazing views. The pleasure of watching a film under the stars on a warm summer night will be a unique experience during your visit in Athens. Plus language will not be a problem as movies are subtitled in Greek, therefore they keep their original language. Here are our best Athens open air cinemas. Offering the best direct view to the Acropolis, Cine Thission in Athens has been ranked by CNN among the top movie theaters in the world. 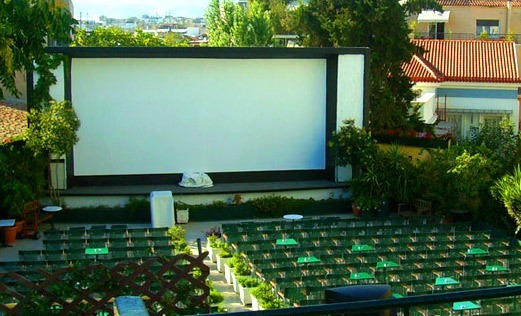 This is one of the oldest Athens open air cinemas, operating since 1935, and it is located on the paved promenade that connects Thission with Philopappos Hill. In Cine Thission, you will enjoy both premiere releases of new blockbuster and independent films and also re-screenings of classic movies. The atmospheric feeling created by the magnificent view and the nostalgic setting is unique. Live memorable moments in Cine Thissio and don’t forget to try the traditional drinks and handmade delicacies offered at the canteen. 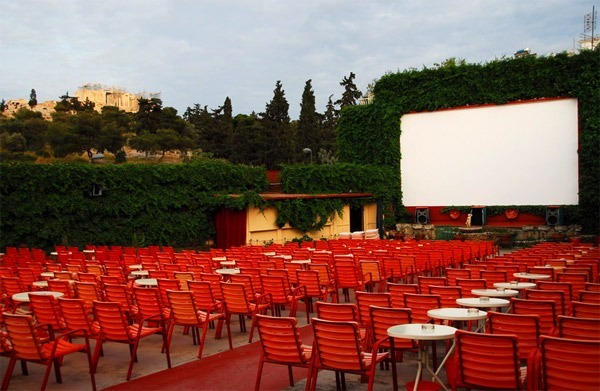 The very first open air cinema in Athens, Cine Paris has been operating since the 1920s. Enjoying an amazing location in the quaint quarter of Plaka, the cinema offers incredible views to the Acropolis, especially at night, when the hill is lighted. A leisurely walk through the streets and Neoclassical houses of Plaka will get you to this splendid outdoor cinema with contemporary film screenings. The rooftop of Cine Paris is enclosed by verdant greenery, small tables and director’s chairs. Old movie posters, which can be purchased at the ground floor, decorate the place. Cine Aegli in Zappeion, just few steps from Syntagma Square in Athens, provides the perfect setting for a cinema night under the light of the moon. Surrounded by verdant gardens with bougainvilleas and jasmines, this summer cinema creates a magical atmosphere. Bring your jacket with you, as it gets chilly during the night, grab your popcorn and relish in the high-tech screenings of new blockbuster movies or classic films. The acoustic system is excellent, making the whole experience even better. A cinema evening in Cine Aegli is perfectly combined with a stroll through the beautiful Zappeion garden and a drink at the luxury Aegli Bar. Cine Psiri is an impressive outdoor cinema, situated in the most artistic area of Athens, the famous quarter of Psiri. Found in the backyard of a theatre, during the winter months this cinema operates as a warehouse. In summer, the place is converted into a lovely cinema that shows European films, both old and new productions. With industrial decoration and high quality services, Cine Psiri is one of the most charming Athens open air cinemas. Perfect sound quality and trees and bushes surround the ample space fitted with cosy director’s chairs and small tables. After a cinema night out, you can continue your entertainment at the many bars and clubs nearby. ← Greek islands in winter: to visit or not to visit?